Gitano is a tropical escape in the heart of New York City based on a bar/restaurant in Talum, Mexico. 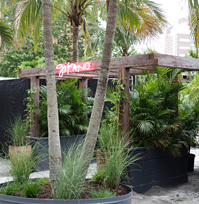 The lot, located near the entrance to the Holland Tunnel on Varick Street, is filled with full-size palm trees and other lush foliage creating a tropical paradise with hidden gazebos. Look for Mezcal-based cocktails with named like Jungle Fever and the Gitano Swizzle, along with small and large plates influenced by the flavors of Mexico.